“Why would you want to write about milk jugs? That’s a stupid idea for a post,” said the little man dressed in hockey gear who just popped onto my left shoulder. “It’s a great idea. They don’t have them in Australia,” said the two tiny surf lifesavers in unison on my right shoulder, both holding up teeny weeny glasses of milk. I looked left and right; it wasn’t a hard decision. And besides it was two against one! And I REALLY like milk jugs! So here’s the deal. In Australia we use plastic containers (that come in 2 or 3 litres) and cardboard cartons (1 or 2 litres). The three litre containers are heavy and the milk rushes out on the first pour. Trust me; it’s not good when you have heavy handed (or weak and puny) kids. I used to think that our containers made perfect sense… until I was introduced to plastic bags of milk in Canada. Here’s how they work. You buy a big plastic bag of milk that contains three separate one litre bags. 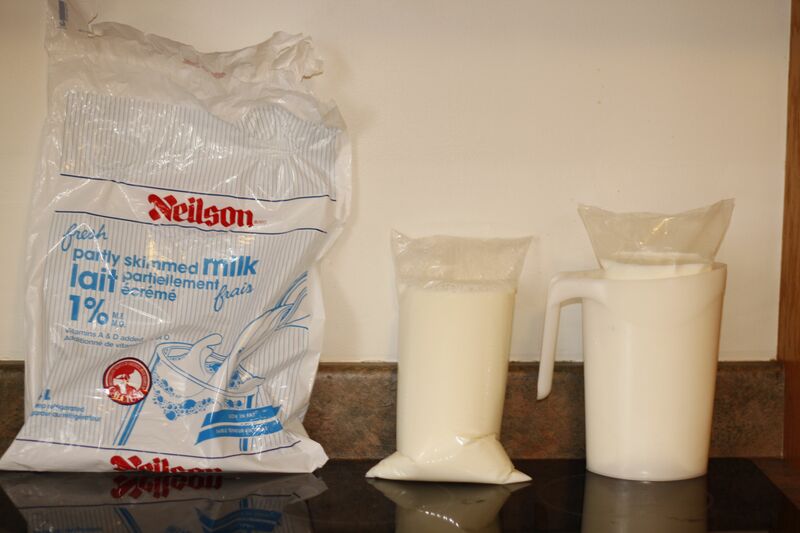 You insert one of the plastic bags of milk into your milk jug, snip the corner and voila! Out comes milk. It’s not heavy, it keeps milk fresh because you are only opening a small bit at a time, and you can control the flow by cutting a smaller or bigger hole. But to be fair, as much as I love milk jugs; there is a trap for beginners. If you shove the bag of milk in and have an air pocket at the bottom, the milk bag sits too high, and when you go to pour it, a big rush of milk lands in your cereal and all over the bench. You can now consider yourself educated about milk jugs. I’m sure it’s a work-based competency somewhere that you can now tick off. This entry was posted in Cool Canadian things and tagged aussie, australia, canada, canuck, milk jugs, travel. Bookmark the permalink. Nic – the size of the hole you cut in the plastic bag is really not as simple as snipping the corner… too big, too much comes out and too little, the milk trickles out… it’s a science really. Thank you Professor Kim – right you are!!! It really is a science. Thanks Nicole….it is said you should learn at least one new thing a day…today I now feel complete. But seriously its a great blog. Miss you guys but your sojourn to canada has introduced me to fb and blogging. Thanks Jean. More trivia that you’ll probably never need to know is on its way!!! Hi Nicole! The other cool thing about milk bags… okay never thought I’d ever say that… They can be recycled into mats. I think they are used in hospitals in third world countries or something. My Dad collects them and cuts them. Does their usefulness ever end? The humble milk bag… who would have thought! Milk in a bag? Now that is just too weird!